The first mention of the Church of God in Rushville was in 1906 when Samuel Ford spoke of 5 people who were saved and four others were baptized. Later that year W.W. Fitzwater began holding meetings in the home of S.J. Farlow near Milroy in the southern part of the county. In 1910 the congregation from Williamstown, with the help of the Milroy group, started the work in Rushville. Prayer meetings were held in various people’s homes. These folks were called “come-outers” because they had all been of different sects and because they held street meetings. They became part of the Reformation Movement of the Church of God which believed the Church was made up of those born again and led by the Holy Spirit of God, according to the teaching of the New Testament. In 1916, through the labors of the local saints, the first building was purchased at the corner of 9th and Oliver streets. There were about 15 members at this time. The early pastors were all part-time with very little pay for their services, but through their dedication they made a very positive contribution during their short tenures. The first parsonage was built behind the church on 8th street. The congregation helped in the construction of the parsonage to cut costs. Brother W.C. Woods and his family were the first to live in the new parsonage.Many pastors had served over the years including Lloyd O. Bowen who was the current state minister in Mississippi. At the end of Rev. 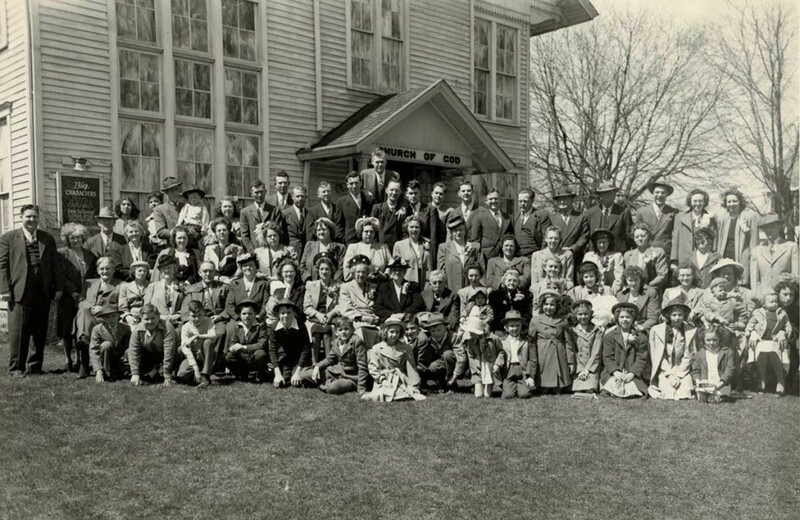 Bowen’s 4 1/2 years he had been the longest tenured pastor in the church’s history. Rev. Charles Justice (B.J.) became the pastor of the church in 1971. He and his family moved here from Madison, IN. During B.J.’s tenure the church purchased land from Roscoe Bowers on U.S. 52 just west of Rushville. Renovation was done to the existing building in 1972 so services could be held and construction was begun on a new church sanctuary in 1973 and completed in 1975. The men and women of the congregation put in much time and effort to construct the building and have enjoyed the fruits of their labor up to this present day. In 1979 the original building on the property was remodeled into a larger building for fellowship purposes with additional classroom space and new kitchen. In the mid 1980’s a new gymnasium was built, and additional classrooms and offices were added. In 1992 Rev. Derek (Rick) Johnson was called as a co-pastor. In 1994 Rev. Justice retired after 22 years of service to the church and Rev. Johnson became pastor. Rev. Johnson served as Pastor until 2004 when he and his family were called to plant a new church in Tuscon Arizona. During Rev. Johnson’s tenure the church went through some modernization of the existing facility with improvements to the educational and worship areas. The church also saw new and younger families added to the church as well as the home-going of many of the older saints. Pastor F. Eugene Fauntleroy was called to shepherd the congregation in April 2005 and served as our pastor until his retirement in April of 2007. In 2007 the congregation completely remodeled the rest rooms, opened a lounge for parents and infants and re-roofed the entire facility. On February 10, 2008 Rev. Gary Jordan became the new and current pastor of the congregation. He and his wife, Rhonda and daughter Mary came to the Rushville from Petersburg, Indiana. In 2008 the parking lot which had deteriorated greatly was resurfaced and in 2009 the narthex has been remodeled.